We are so proud and excited to present to you the cover art for author, Thom Powell's new book, "Shady Neighbors." We even have an excerpt that takes place about halfway through the book. We chose this excerpt because it pairs well with the cover art, with a reference to the muddy baseball. 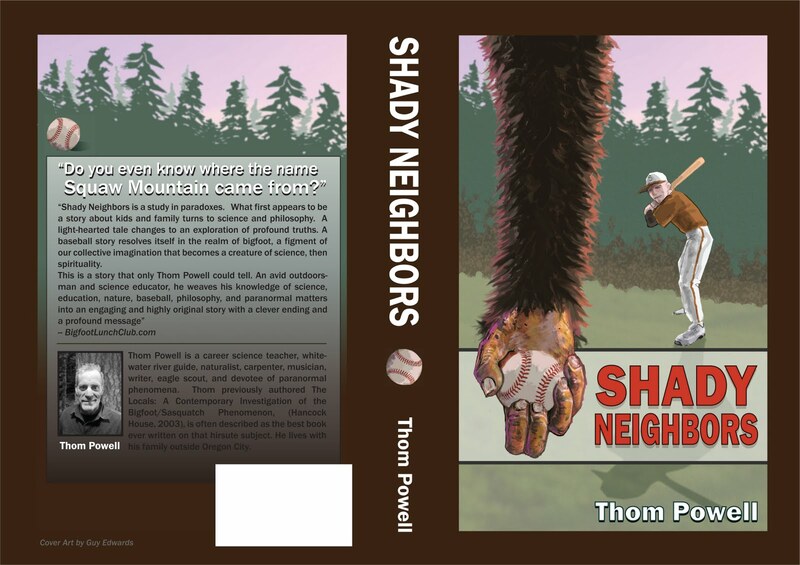 Plus, its a great teaser for what is in store from the mind of author, Thom Powell. Many themes from his blog and unique perspective are woven into this great narrative. Sam looked at his watch. It was 4:30 a.m. He thought about calling Nick right then and there. He thought he should wait. Sam didn't even want to go back to bed and try to sleep. He didn't think he could. He got his robe from the hook on the wall in the bathroom and put it on. "Are you thinking what I’m thinking," Sam asked. "I think so," Nick replied. "We need to fix that grave right away. Like, today. I'm not going to sleep until we put it back like we found it." "How soon can you get over here? I can be ready to go in an hour." By 8:30 the two men were motoring up the road toward Squaw Meadow, bouncing on the bench seat of Nick's pick up; staring silently at the road ahead. Nick broke the long silence. "I hate to ask what happened to you last night?" "Nothing major," Sam replied with his usual sarcasm. "They basically made it clear that they would smash my house and my kids if I didn't put the grave back, post haste." "Three of 'em. They were waiting for me on the lawn when I ran out of the house. One of them kept saying, 'Put my grave back.' It was the scariest, most vivid dream I think I've ever had. To top it off, after my wife woke me up, 'I got up the courage to go outside. There on the front porch was this mud covered baseball. It seemed like a calling card. The dog could have left it there, I suppose, but after that nightmare, I'm not taking any chances. I don't ever want to have another night like that. How about you?" "I kept waking up to the sound of rocks hitting my roof. Then sticks were hitting the side of the house. Every time I would go to sleep I would see this angry face saying, 'Fix my grave, fix my grave.' Then, I'd wake up and hear rocks on the roof. I'd fall asleep and hear the voice and see the angry face again. Then I'd wake up. More rocks. This went on all night. I didn't sleep more than a half hour all night. By four a.m. I knew I wasn't going to get a wink of sleep until we got up there and fixed the grave." "Think they might be waiting for us when we get up there?" Sam wondered. "I hadn't even thought of that," Nick confessed. He thought for a moment. "I suppose that after the night I spent, I'm willing to take that chance. I don't think I'm going to get any sleep until we fix that grave. I don't think my roof can take another night of that," Nick said a faint smile. Then he added, "I suppose if they're ready to kill us when we get there, then we won't be able to fix the grave." With a smile, Sam said, "I suppose." Then he added, "Maybe they'll just wait until we fix it before they finish us off." Nick managed to crack a slight smile. Then Sam asked pointedly, "By the way, do ya still think they're just some damn apes?" We will keep you up to date when and where this book will be available for purchase. Sure we are partial, but we promise you you will turn page after page until you have read all 366 of them. It is informative, educational and over all entertaining; complete with an extremely satisfying ending. This book looks fascinating. The only thing that worries me is that there are multiple proof-reading oversights just in this brief excerpt. If it is representative, then there are hundreds of errors throughout the book, which will really undermine the credibility of the text and the quality of the reading experience.